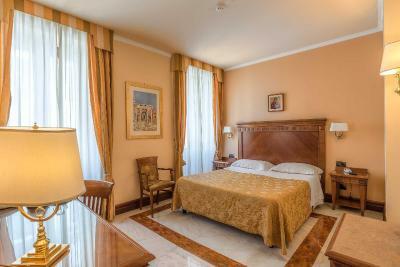 Lock in a great price for Hotel Alimandi Vaticano – rated 8.8 by recent guests! location and balcony a little up keep and you could have a 5 star hotels "Detail" Personnel was excellent and very courteous and helpful. 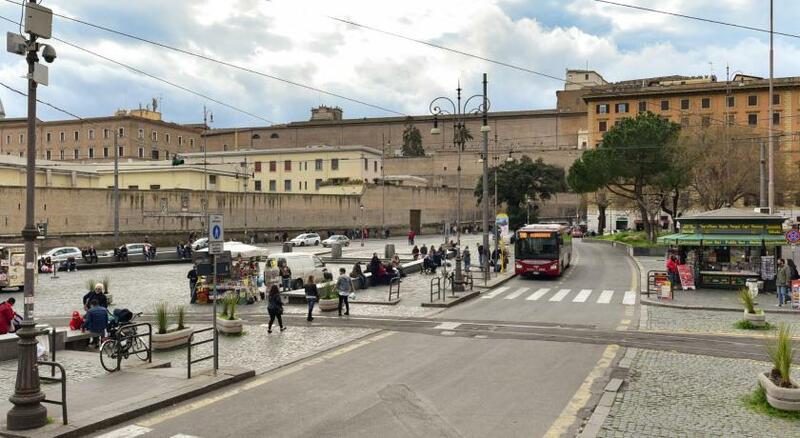 Across the road from the Vatican Museum and about 12 minute walk to St Peter’s Square. Same time to get to a couple of Metro stops in order to go downtown. 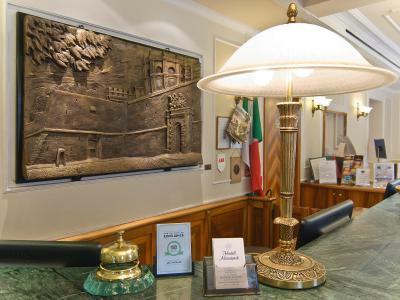 This hotel is in a great location right along the wall of the Vatican and across the street from the line to get into the Vatican. Great staffs Andrew and Nico were very helpful with their recommendations, places to eat, visits and directions. The hotel is across the street to the entrance to the Vatican museum and it is next to the restaurant where all the tour groups meet for the Vatican tour. Very convenient!! Nico, on the reception desk, was so helpful, happy and friendly. He went above and beyond to make sure our stay was great, he gave us accurate advice on public transportation and ideas of where to go and see and when my daughter left her beloved teddy bear in the room he made sure it was kept safe until we organised how to collect it. There is a great, family friendly, restuarant close by called Spaghetti that I recommend for their great service and staff. Hotel is across the street to the entrance of the Vatican. 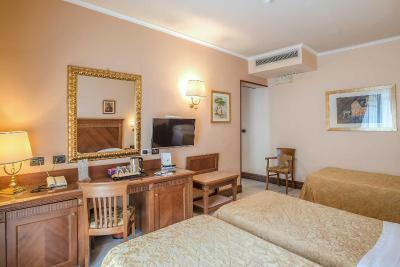 Hotel Alimandi is superbly located just across the street from the Vatican museum. We could see the lines from our room window. The staff are friendly and helpful. The breakfast is complete. Cereal, eggs with bacon, yogurt, fruit and lots of pastry options. Saves a lot of hassle to have early ample breakfast prior to sight seeing. 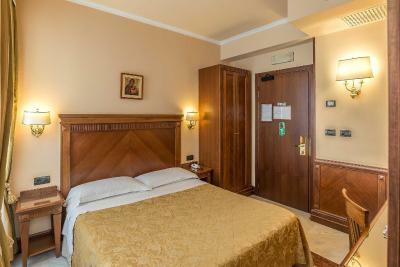 Hotel Alimandi Vaticano This rating is a reflection of how the property compares to the industry standard when it comes to price, facilities and services available. It's based on a self-evaluation by the property. Use this rating to help choose your stay! 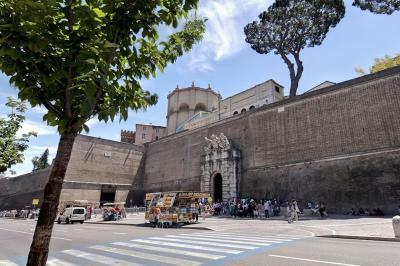 Hotel Alimandi Vaticano faces the Vatican walls and the entrance of the Vatican Museums. 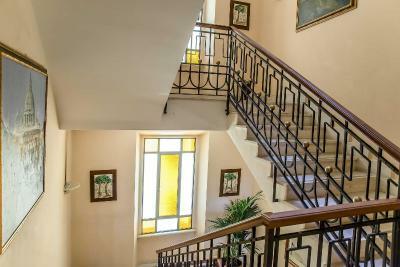 Featuring Art Nouveau-style decor, it provides free WiFi throughout and rooms with flat-screen satellite TV. 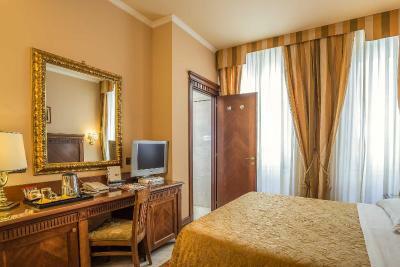 Rooms are classically furnished. 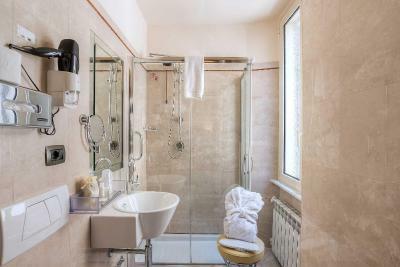 They include a mini-bar and a private bathroom with hairdryer. 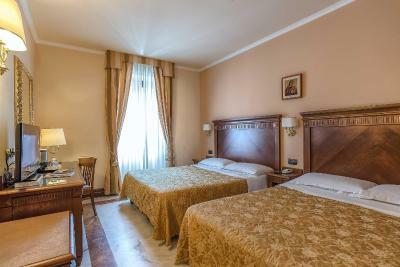 Most rooms overlook the Vatican Museums or the historic walls. A generous buffet-style continental breakfast is served every morning in the bright dining room. 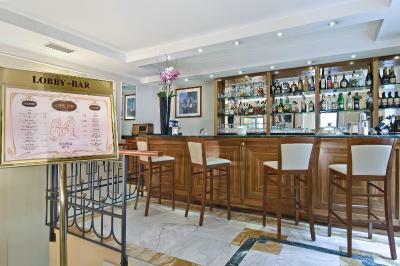 Drinks can be enjoyed at the Alimandi Vatican Bar. 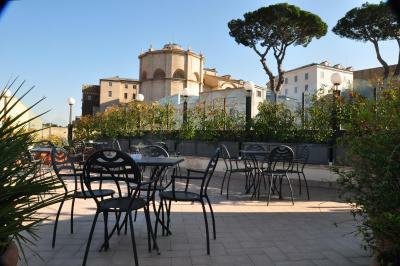 Guests can relax on the street-view terrace with tables and chairs. 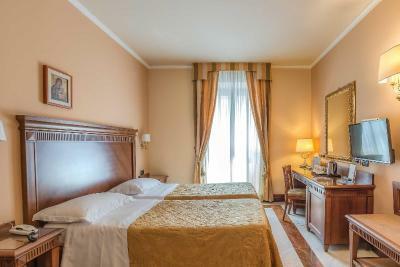 The Alimandi Hotel is 1,650 feet from Cipro Metro Station and a 10-minute walk from St. Peter’s Square. The surrounding area is full of restaurants, shops and bars. 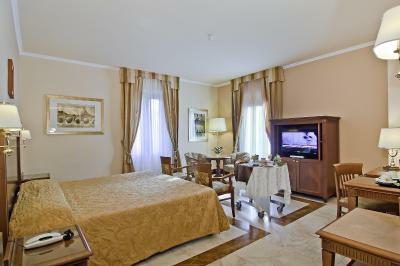 When would you like to stay at Hotel Alimandi Vaticano? 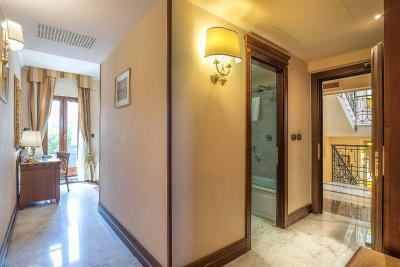 Overlooking an internal courtyard, this air-conditioned room has a mini-bar, free WiFi and a private bathroom. Twin beds are available on request. 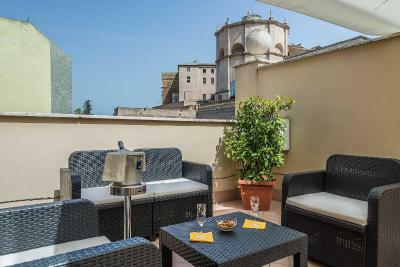 Overlooking the Vatican Museums, this air-conditioned room has a mini-bar, free WiFi and a private bathroom. Please specify bed-type preference when booking. 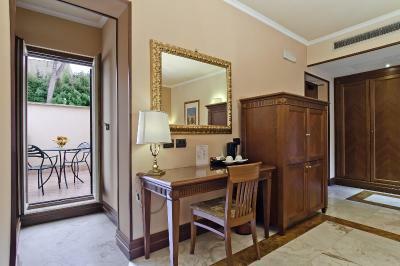 Overlooking the Vatican Museums, this air-conditioned room has a mini-bar, free WiFi and a private bathroom. 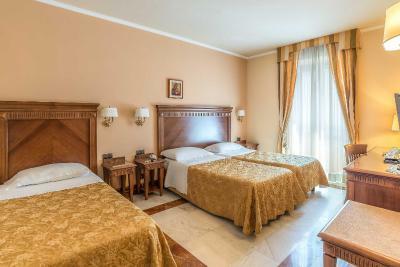 Larger room with 2 queen-size beds. 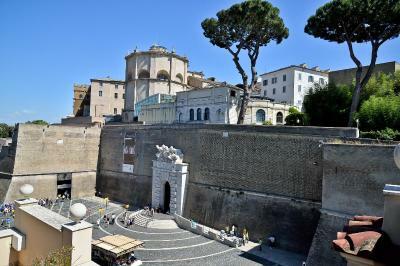 Overlooks the Vatican Museums. WiFi is free. 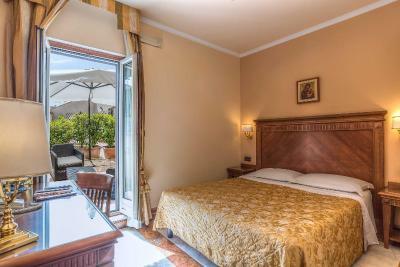 Spacious room with king-size bed and view of the Vatican Museums. WiFi is free. 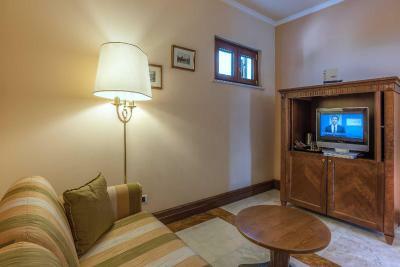 Overlooking the inner courtyard, this smaller double room features air conditioning and mini-bar. WiFi is free. 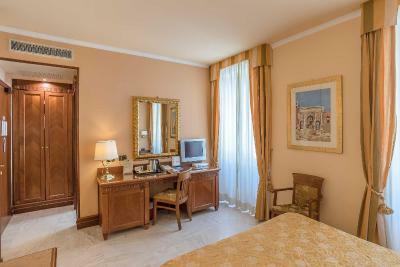 Located on the top floor, this junior suite features a seating area and a private balcony with views of the Vatican Museums. It comes with air conditioning, flat-screen TV and mini-bar. WiFi is free. 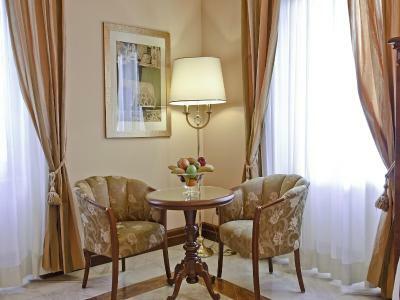 Located on the top floor, this suite features a private balcony with views of the Vatican Museums. It comes with air conditioning, flat-screen TV and mini-bar. WiFi is free. 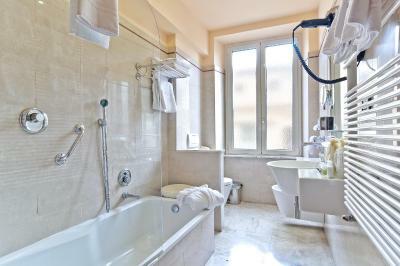 This larger air-conditioned room has a mini-bar, bathrobe and a private bathroom. WiFi is free. 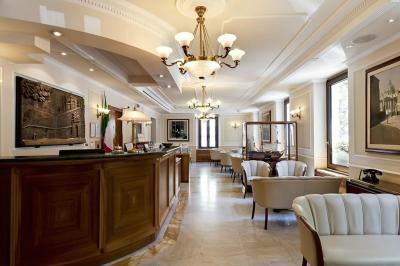 House Rules Hotel Alimandi Vaticano takes special requests – add in the next step! 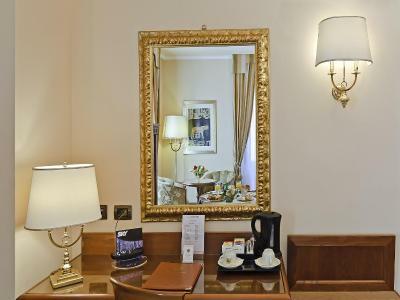 Hotel Alimandi Vaticano accepts these cards and reserves the right to temporarily hold an amount prior to arrival. The dated and broken parts of room particularly the wall and the smoking out side but that was not hotels problem. Floppy shower head only downside. 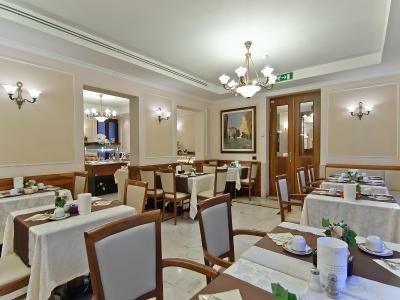 Great breakfast and helpful to have the earlier time on Wednesday mornings (7am) to allow guests time to have breakfast and then get to the audience with the Holy Father. 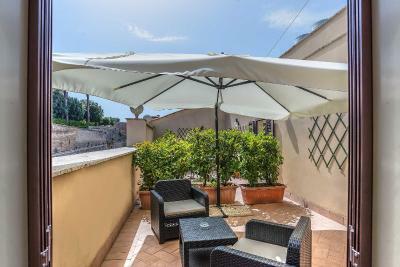 Location, location, location, opposite the Vatican museum, close to shops and restaurants. The receptionist and the cook were great and always their to help in anyway it was needed. In particular, Nico, the Hospitier, was very friendly and helpful. He made perfect suggestions. Thank you! Hard to adjust the temperature in the room - just wanted to turn the AC off! Overlooking a fairly busy road, I needed earplugs to block the traffic noise. Exactly next door to meeting place for early morning Vatican tour - could not have been more convenient for this. The museum entrance is just across the road, and it's only a few minutes walk to the Metro station. We found the fridge door stuck and very hard to open. 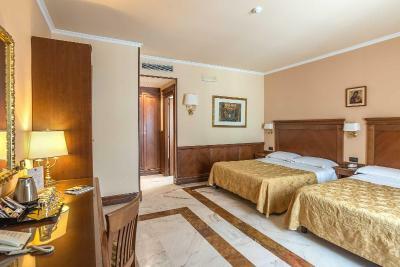 The position of the hotel was my main criteria as we had a very early tour (6am) of the Vatican Museums! The bed and pillows were a little uncomfortable but didn't stop us sleeping. The staff on reception were absolutely lovely and went out of their way to help. The location is excellent for a visit to the Vatican. Good breakfast and the breakfast starts early - 7am - if there is an audience with the Pope. You couldn’t really close the curtains (they were decoration only randomly) so you had to make do with the shutters which don’t block all the light. Luckily we got around this with the use of curtain ties and one of my hair clamps! Also no provision for non dairy milk at breakfast but I found a shop two minutes away that had everything. 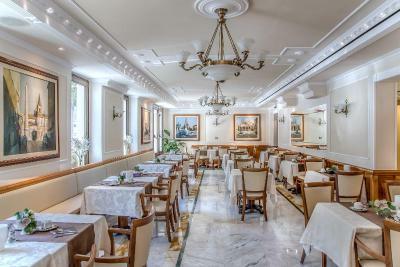 Amazing location, right next to the Vatican and close to some of the best restaurants (not expensive) we’ve come across in Italy. Good size family room. If you get a room at the front it is a busy road though, so you’ll hear traffic noises night and day. The staff were great, very friendly and helpful. We will definitely go back.